The Gentleman Crafter: Quote Wallet With a 4th Spin! Thanks for coming out to the show last night! 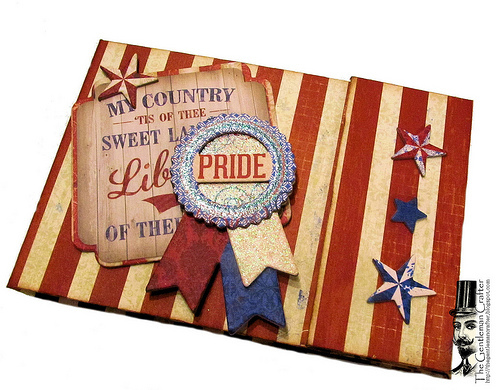 We had a great time putting a new PATRIOTIC spin on the quote wallet. I had so much fun being with you all. It was good to get back into the swing of things again! So thanks tons! You can catch the recorded Ustream of how to make this project HERE.... Have an awesome day and Thanks Again! really cute, I enjoyed being in class. Thanks! Love the patriotic quote wallet! It was good to see you "struggle" making decisions on what to do when you found out you didn't have the particular embellishment you wanted and "making do". So many of us are in that boat all the time when we want to do a project and don't have, can't find or can't afford the one thing we think we need/want and have to find inspiration in what we do have. Plans for the holiday...none. Hoping to find my muse and get creative in my studio. Mum and I are in Hilton Head Island!!! Plan on visiting your favorite craft store in the next few days! Any other tips? Weather not so good, but hey, who could not love being here, rain or not? oh that turned out great! can't wait to watch the video! Happy 4th to you, Jim!! Happy Independence Day Jim!!!! Hope you rest up some too! 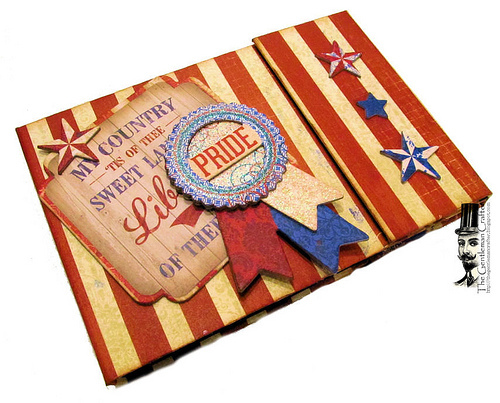 Love this wallet album....so festively cool!!!! Not doing anything special for the 4th, just hanging out with my family. Maybe do a card or 2 for HC design team release. Yesterday was my first live class with you, LOVED IT. Thanks for another great Ustream show and another fantastic project! Love your creations and I can't wait to see what you have been working on for CHA!! Happy Independence Day! Enjoyed the show last night. Can't figure out why I can't get the chat to work. Maybe next time. The show was a lot of fun last night! I was happy to see you feeling more yourself. The 4th - it's my husband's birthday and this year it's his 65th from which he's trying to hide. I'm off to make his card (nothing like last minute, right) and get together a BBQ. Happy 4th to you and Cesar. Sorry I missed the live stream, but I love what you did, that paper selection is awesome ! Oh my gosh, not the latches again! It looks great without them! Let it go. No plans for the 4th, except make sure my house doesn't burn down from all the illegal fireworks going off around us. I hate 4th of July, actually, I hate fireworks, always have since a wee tickbug. I know how un-American. Luckily my son is off camping for 4 days with some friends. Glad you were back in rare form last night, we've missed "Jim". Love the quote wallet Jim! Thank you for giving it away :) It is at home on a little shelf in my art room. Thanks for streaming and sharing your gifts and talents with us. After reading about the nightmare flight you had to Vegas I have decided to go on a separate flight to Italy, a day early : ) Praying a safe flight back from there for you!